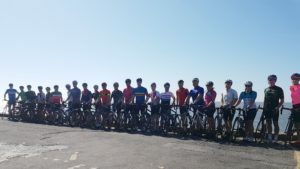 We have riders of all abilities undertaking the Cyclone24 challenge, some are beginners, some are experienced, some are competitive, some are not, and most are raising money for a charity close to their hearts. Over the next few months we’ll be introducing you to some of our past participants to get to know their reasons for taking on the track. As it’s Women’s Sport Week 2017, we’re kicking off our rider interviews with Joanne Kelly who took part in our recent Manchester challenge in May this year. Aged 22 Jo was diagnosed with Hodgkin’s Lymphoma. At 25 she was given just months to live. After a freak response to a last ditch attempt at chemotherapy, Jo under went a stem cell transplant and now 5 years on, she’s still here and undertaking some pretty big challenges. As part of her recovery, Jo started cycling, got hooked, and is certainly not doing things by halves. Amazingly Jo managed to fundraise over £1,500 in just two weeks for St Ann’s Hospice as part of the Cyclone24 challenge. An awesome effort. Here we find out a little bit more about her experience of Cyclone24. I first found out about Cyclone24 through the Women’s Cycling Manchester Facebook group. 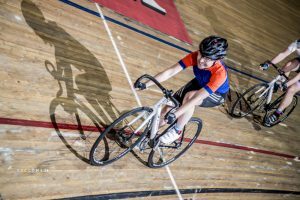 I had been looking for a 24 hour challenge to take on this year and I love to cycle on the track, so my interest was piqued. I leapt at the chance to take part when Zoe the director wanted to put together an all-female team. Being able to fundraise for a charity that I had a personal connection with as well was the icing on the cake. I really love endurance events, given my medical history I’ve learnt how to dig deep and push myself over long distances, it was a bonus that this challenge wouldn’t have the added complication of less than perfect weather conditions! How did you do prepare for the challenge? My involvement was fairly last minute, but I upped my road riding a little and attended a couple of track taster and regular rider sessions to brush up on my skills. I then ate my body weight in pasta in the run up to the weekend. Meeting the other women who formed the “Dream Team” on the day for the first time, learning all about them and their cycling achievements, and coming together to form such a fantastic team will hands-down stick with me as one of the best experiences of my life. The energy from the whole event was infectious and we buzzed off it! You took part in our Manchester challenge at the Home of Team GB, did that serve as inspiration and did you ever pretend you were Laura Kenny whilst cycling? It was really weird to nip to the loo opposite the Team GB quarters! I definitely channelled my inner Kenny to sprint the last few laps of each shift on the track – overtaking is addictive! I was surprised to realise that I felt pretty good despite such little sleep – I almost wanted to carry it on for another 24 hours! I was so proud of my teammates, especially as some of them had never ridden the track before and turned out to be quite the velodrome superstars. I think that high lasted for at least another fortnight as well. I’ve proved to myself that anything is possible when you apply yourself and work hard. If you’re a beginner, get yourself comfortable and confident on the track with practice sessions – you’ll ride faster, smarter and safer. Snack often to maintain that optimum pace. And prepare to be rudely awakened at 6am to blaring country music – Cyclone24 will treat you mean to keep you keen! Jo isn’t stopping here either. She’s recently started training for her next challenge, running the London Marathon in 2018. We know you’ll smash it Jo!